There was a time when Soave and Valpolicella were a lot of people’s go-to white and red because they were cheap, cheerful, and available everywhere. Those days are gone and most would say good riddance. Cheap Soave and Valpol may be out of favour but I suggest you try the new, improved edition of these wines. No longer cheap, but outstanding stuff – and value, in the mid-teen price range. An excellent dinner party pair for sure. Italian winemakers have decided that the best way to compete with the popular International grape varieties is not to go head to head, but to offer an alternative. Such as improved editions of their traditional regional wines. Such as Soave and Valpol. Anselmi’s wine is semi-rich and oozing charm. The golden colour you see in the clear glass bottle comes through in flavours of honey and exotic fruits. But the wine is also crisp and elegant. You wont find the ‘S’ word on Alselmi’s label because the winery wants to distance itself from Soave’s old days and lowly image. 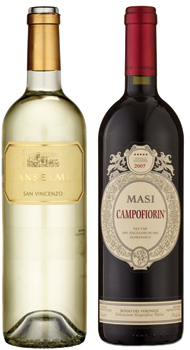 Masi’s Campofiorin was one of the first ‘improved’ Italian wines and has grown into a very successful brand. But without losing quality. If anything the current 07 vintage may be the best wine ever. 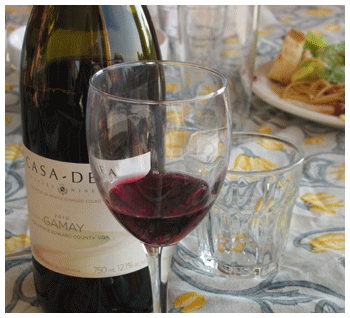 Expect some of the solidness of a Cabernet, the lushness of a Merlot and the charm of a Cotes du Rhone. But it’s none of these. Campofiorin is an individual in a sea of taste-alike red wines. I love the mix of gusto and grace. So Italian. Previous articleWin Wine & Chocolate Passes! I’ll vouch for Masi Campofiorin — I’ve been drinking a few bottles of late. Good to see it hit your list Billy!